Heather’s Whole Food Kitchen workshop kicked off a little over a week ago and I have been enjoying it immensely! We were all flat-out sick last week, so it took me a while to start trying the recipes, but every one so far has been a winner. 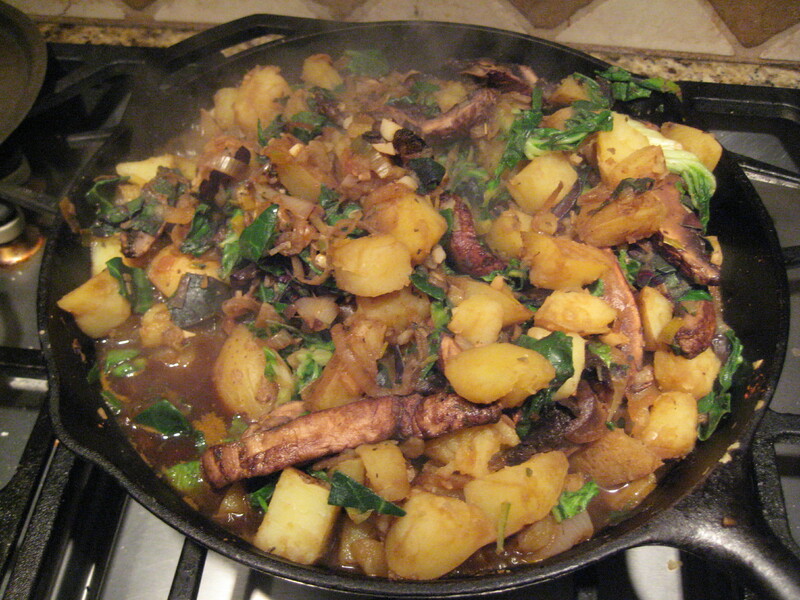 Last night it was whole food comfort food- Potato, Kale and Portobellos. It doesn’t photograph well, by my oh my, it was delicious. It was so flavorful ,seasoned with soy sauce and chili sauce. I just served some scrambled eggs along side for everyone else, and the kids all ate it (yay!). We have also had a Chicken and Spinach stirfry that was delish, and on the menu tomorrow is Bean, Kale and Sausage Soup. It is called Romanesco cauliflower. Isn’t it awesome? 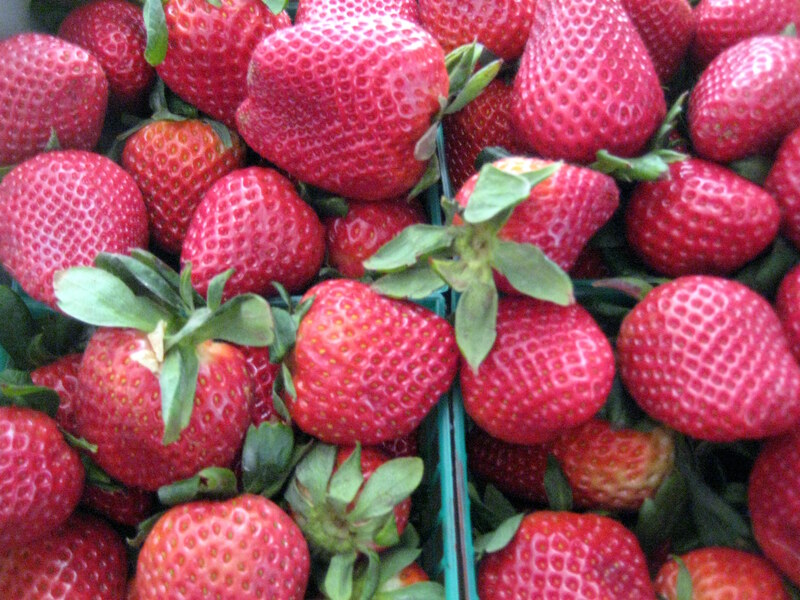 And how lucky am I to live in southern California and have delicious, locally grown strawberries in February? It is the ultimate Valentine’s Day present for my family- strawberries for dessert. Of course, there will be chocolate too. I’m sorry to hear that you all ended up getting sick, poor you! I can only imagine how that was. Not fun! The workshop sounds fantastic, much more family (and husband) friendly than the vegan one. The bean, kale and sausage soup sounds really yummy. I’ve seen the Romanesco broccoli before, but never a cauli cross. It looks like coral, or something from under the sea, so unusual. 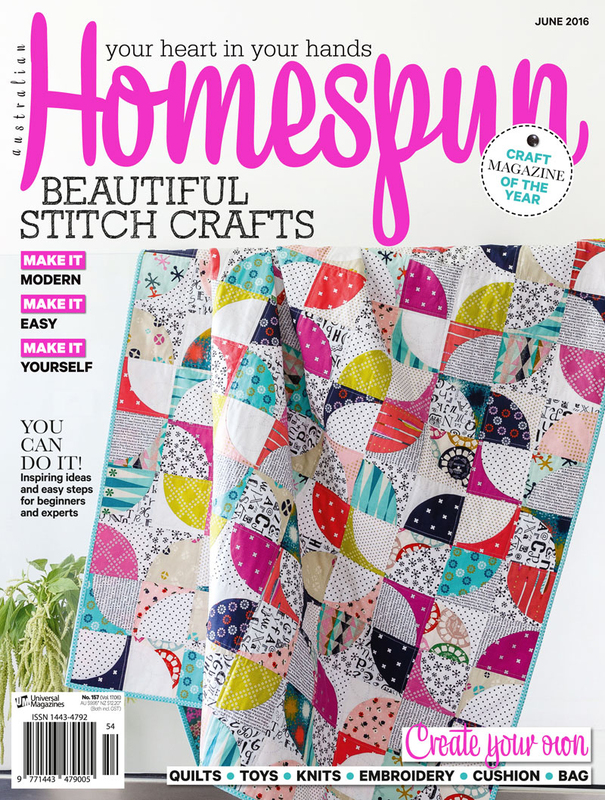 It looks like you belong to a really wonderful CSA scheme. They aren’t very common here at all. Such a pity. Those strawberries look so fresh and beautiful. Enjoy your lovely vegetables and healthy eating. I hope you post lots about it. I’m sure you will all reap the benefits of it many times over. It’s great that the kids are enjoying it too. The workshop has been fun so far. Definitely easier on the family that the vegan one! 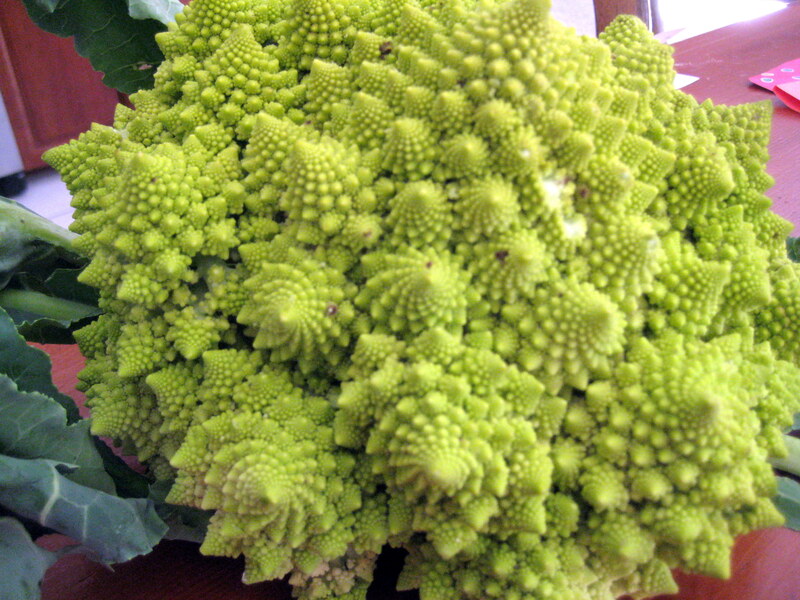 I had no idea there was Romanesco broccoli! That is so cool. I am totally lucky that we have such a great organic CSA- I had to wait about 5 years though. Don’t lose hope! How wonderful that you are enjoying the workshop. Looks so yummy. And that cauli is awesome – I’ve never seen anything like it. I bought stuff to make the miso soup and am looking forward to that. Unfortunately I live in one of the worst towns for getting organic or healthy foods like kale :-(. Everything looks delicious! 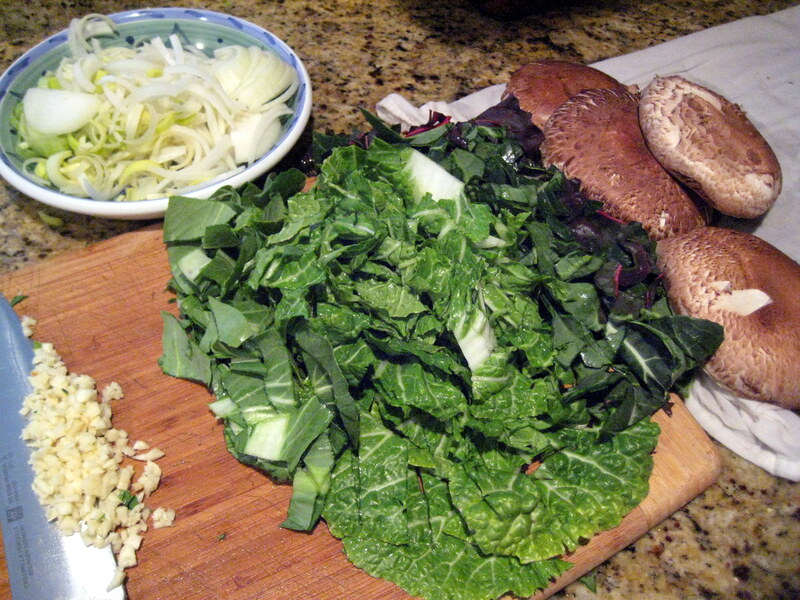 I haven’t tried the potato, kale and mushroom yet but I think it’s on my list now! Good! It was delicious, but looks rather gray the next day 🙂 Still tastes just as good though!